Having a set of twins is purely luck you can never plan to have twins. The chance of having twins is there but like i said its a chance. there is no clear percentage or ratio or a certain way that will grantee you will have twins. Twins will just happen and what you ll get its a surprise to. You might two boys or two girls or a boy and a girl. the type of twin is also a surprise you might get fraternal or identical twins. Fraternal twins are two twins who came from two different fertilized eggs. Identical twins are from one fertilized egg that split into two embryos. Twins can be a big strain. You might be planning to have only a single baby and not twins. Now you have to go buy one more of everything and the cost doubles for everything now to. Now you have to buy two of everything your going to need for the baby and that can have a big strain on you. Unless you were ready for whatever happens. Then having a twins might be a gift now or mabey they were so pot to have twins no matter what i see as having twins a gift something that was meant to be. There are many type of thing that can go wrong when having twins. One of those things is that maybe one twin might not make it through all the way or they might become conjoined without knowing.Conjoined twins are a rare phenomenon that occurs every 1 in 50,000 births to 1 in 100,000 births. As you see the chance is vary low but its there and the numbers are not that big. There are two theory s that can explain this phenomenon. the first theory is fission when the two eggs separate but don't separate all the way. The second theory is the most accepted and most reasonable one and that's fusion. Stem cells search for identical cells so they can combine. 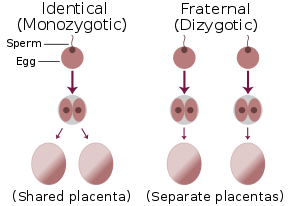 The theory says that the stem cells search for other stem sells and they find the ones from the other egg and begin to combine. The second theory is more accepted then the first but both theorys can be true. Working Links: Link work, although using wikipedia as a source isn't the best because wikipedia has very unreliable information. Recommendations for making the essay better (spelling, grammar, pictures, facts, etc. ): The sentences were poorly formatted and there were many words misspelled. Not very much information, and the text isn't easy to follow.